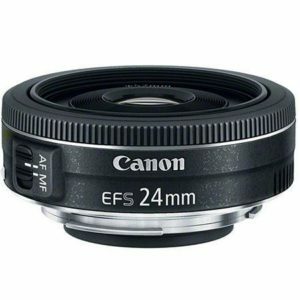 The Canon EF-S 24mm f/2.8 STM is a so-called “Pancake” lens due to it’s extremely short length (less than 1-inch). This lens is designed specifically for APS-C cameras and will not mount on full frame cameras. When mounted on an APS-C camera it gives an equivalent field of view as a 40mm lens on a full frame camera. Of course Canon makes a full frame 40mm pancake lens that will mount on APS-C bodies as well. This lens is the APS-C version of the 40mm for full frame bodies. I have previously owned this lens and found it to be one of my favorites. That is until I upgraded to a full frame body and the 40mm version of this lens is now one of my favorites for the very same reasons. I used to shoot with Pentax and loved their Limited pancake lenses. Canon must have asked, “What would it take to get Dave to switch back to Canon” and came up with this lens as an answer. Well, it worked. Image quality from this lens is fantastic. Images are sharp and contrasty from the lens. The f/2.8 max aperture also helps in low light and to somewhat contol your depth of field as well, although due to the 24mm focal length on an APS-C body you won’t get as much control as you would from say the 50mm f/1.8 STM lens. build quality is decent enough. the lens features a metal mount and is made of a high quality plastic body. I do not care for the lens hood design as it interferes with using filters. Alternatively you can use a metal or collapsible rubber hood on this lens if you feel the need to have a lens shade. Overall I would recommend this lens to anyone who shoots with a Canon APS-C camera. This lens will open up a lot of possible creative photos for not a lot of money. based on 857 user reviews online.